Angel paintings have captured the imagination of people through different periods of history. Artists have attempted to portray the celestial beauty of the messengers of God, and in most instances they have achieved their aim. Of course, earlier paintings are more religious in nature than contemporary ones. But all images of angels have the power to affect us in positive ways. Some times they uplift our spirits in an almost magical way. Other times they inspire us, comfort us, and soothe our souls. Many of the paintings listed here are very well-known. Others are less popular, but they are all majestic. And the best news is that you can find fine reproduction of these angels paintings. Angels appeared in many Renaissance works. Some of the most famous painters of that era painted angels. 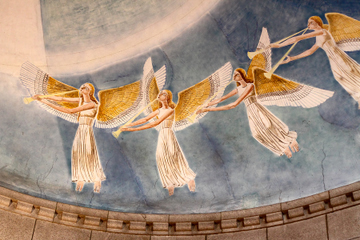 These are just a few of the best known angel paintings of this period. Many an angels painting was inspired by Bible stories, like the ones listed below. Most likely you have seen the angels of this French painter. William Adolphe Bougeureau (1825-1905) painted mythological creatures, angels, and other fantastical beings, and his unique style earned him a following of fans and imitators. Interestingly, most of his works are life size. Angels are still a favorite subject matter for many modern artists. You will find a wide selection of styles: from fantasy to new age to realism. Luckily, as I said before, you will find good-quality reproductions of most of these paintings. Needless to say, all of these pieces make wonderful gifts for any occasion. I'm sure you will find the perfect angel painting for the gift recipient. Check back regularly as I will add the images of the paintings mentioned here.